I’m a sucker for Italy’s town festivals. The more original the sagra the better and there are few more original than the Battaglia delle Arance, Battle of the Oranges, in the northwest city of Ivrea. 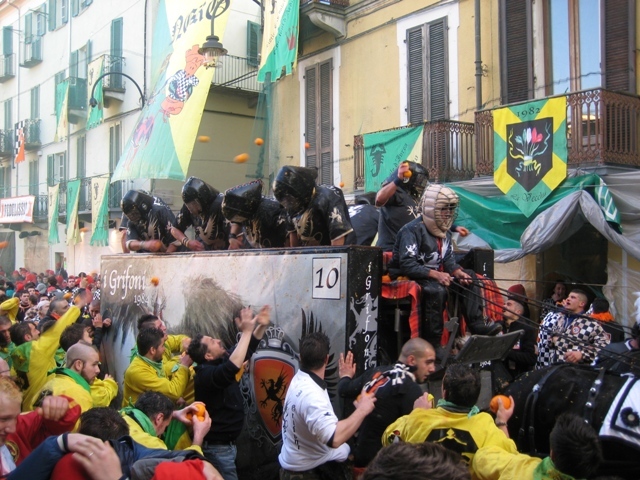 For three days culminating in Fat Tuesday (martedì grasso) Ivrea comes alive as the city splits into nine teams that violently pelt each other with oranges. Battle is not hyperbole here, they really do battle. One look at the team names – Death, Ace of Spades, Black Panther (which its members say is “a symbol of hegemony and territorial conquest”), Devils, Mercenaries – makes clear that these people take their orange throwing seriously. A singing tour guide shows the less violent side of Ivrea’s carnival. Where did my buddy Braveheart go? Who’s gonna clean this mess up?